For those unfamiliar with poker rules and the game of Poker, along with others who might want a refresher, this is the most basic of basic poker. The various games are based on this. Poker is a game of five card hands dealt from a 52 card deck of standard playing cards. 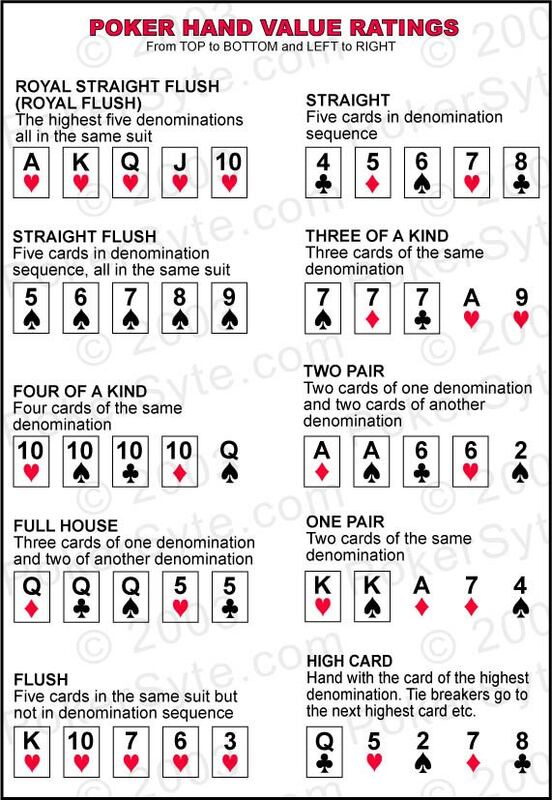 All poker hands consist of exactly five cards. Most games, like seven card stud for example, give the players more than five cards to select from, but the final winning result goes to the one with the best five card poker hand. In the popular stud poker games, the players are all dealt one card at a time or in small groups and they bet money each time they get more cards. They bet that they will end up with the best hand. The players that don't want to bet on their hands any longer can "fold" their hands, get out of the contest and forfeit all the bets they have made to that point. At the end, the player with the best poker hand wins all the bets. In draw poker the players bet, then replace the cards they don't like with new ones from the dealer and then bet again. The best hand is determined by the Poker Hand Ranking chart below. Mobile Users - I've created a special chart in universal .pdf format for easy viewing on narrow screens. The original large chart is also available for downloading, viewing or printing. Can you name these Poker Legends? In 1978, Doyle Brunson, two time winner of the "World Championship of Poker" at Binions Horseshoe in Las Vegas, published probably the best ever written book on casino level poker games. This 600 page, 3 lb. volume is more like an encyclopedia reference than a typical poker book. The work is packed with sound professional advice with volumes of stats for advanced players and was strangely named "How I Made Over $1,000,000 Playing Poker". In reprint, it is now named "Super System". For this classic, Brunson enlisted the services of some of the best professional poker players in the world, all champions in their own right, to collaborate the authoring of the game sections of their particular specialties. 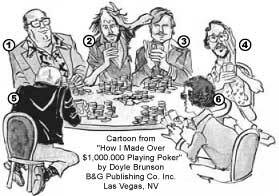 The cartoon of this world class poker game is shown on the books inside front cover. Here are the players and their game contributions.